Danny Ainge has three Championship rings, two as a player and one as an executive. He has learned how to build a championship team, and he may be about to do that again. After the 1979-80 season, Auerbach completed what may be the most lopsided trade in NBA history. Auerbach had always been a fan of stockpiling draft picks, so even after the success of 1979-80 the Celtics had both the 1st and 13th picks in the 1980 NBA draft left over from the M.L. Carr trade. Auerbach saw an opportunity to improve the team immediately, sending the two picks to the Golden State Warriors in exchange for center Robert Parish and the Warriors first round pick, the 3rd overall, University of Minnesota power forward Kevin McHale. With these three future Hall of Famers on the team the Celtics had a core in place to become a dominant team in the NBA. Please refer back to Lesson #1. 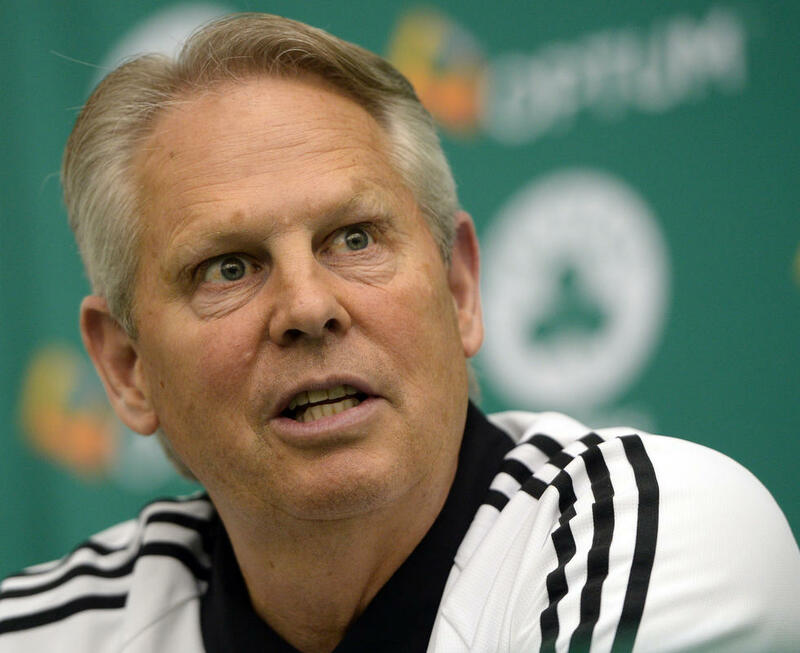 Robert Parish and Kevin McHale for Joe "Barely Cares" Carroll? Come on! Three Championships followed in 1981, 1984 and 1986. Bill Russell/Bob Cousy/John Havlicek - Dave Cowens/JoJo White/John Havlicek - Larry Bird/Robert Parish/Kevin McHale. A lot of Championships there. The 2007–08 Boston Celtics season was the 62nd season of the Boston Celtics in the National Basketball Association (NBA). Powered by the acquisitions of perennial All-Stars Kevin Garnett and Ray Allen in the off-season, the Celtics finished with a record of 66–16 and posted the best single-season turnaround in NBA history. There are a number of reasons for this, but it may be that every NBA team knows where they will be drafting and connivers need time to connive. It could be that simple. Tony Allen, P. J. Brown, Sam Cassell, Eddie House, James Posey and several more. Put three superstars on the court (Paul Pierce, Kevin Garnett, Ray Allen) with inexpensive contracts who are eager for a ring. It can work and did in this case. The Celtics have one superstar in Kyrie Irving. They have another on the verge of superstardom who was derailed too early in the process in Gordon Hayward. The third star, Al Horford, has not made the jump to superstar as of yet. Al is the wild card here. His age is not much of an issue. He is 31 years old, and the Pierce/Garnett/Allen trio were all in the 29-31 year old age range in 2007 when they united. There is a reasonable shot at a Title this year, but Danny certainly has his eyes fixed on next season. I believe he truly wants a Championship in 2019. Horford fits the Celtics style of play perfectly, and if Ainge thinks he will see significant further progress from the youngsters, including Terry Rozier, Jayson Tatum and Jaylen Brown, Al will remain a Celtic. If Danny does not envision a Title next year with the present cast, he will go for a major trade this summer. He has the draft picks and talented young guys to make it work. Al could be a casualty in the process due to salary-matching. The NBA draft and summertime are on the way. By fall, we may have filled in Lesson #6.